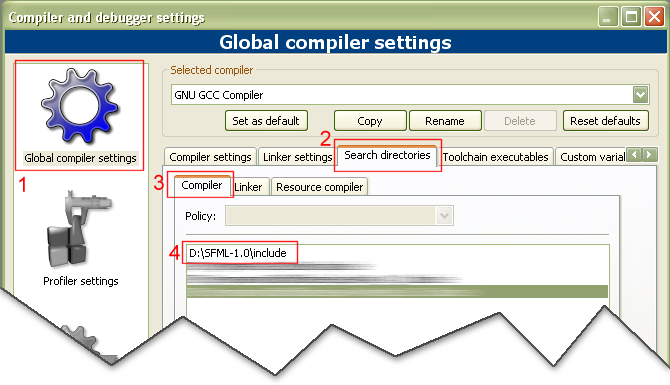 This tutorial is the first one you should read if you're using SFML with the Code::Blocks EDI, and the GCC compiler (this is the default one). It will explain how to install SFML, setup your IDE, and compile a SFML program. Important: this release of SFML was compiled with gcc 4.4, if your own version doesn't match and is incompatible, you'll have to recompile SFML. First, you must download the SFML development files. You can download the minimal package (libraries + headers), but it is recommended that you download the full SDK, which contains samples and documentation as well. Open your project's build options, then go to the Linker settings tab. In Other link options, add the SFML libraries you are using, with the "-l" directive. Here we only use libsfml-system.a, so we add "-lsfml-system". For the Debug configuration, you can link with the debug versions of the libraries, which have the "-d" suffix ("-lsfml-system-d" in this case). This is for the dynamic version of the libraries, the one using the DLLs. If you want to link with the static version of the libraries, add the "-s" suffix : -lsfml-system-s, or -lsfml-system-s-d for the debug version. Basically, every SFML library depends on sfml-system, and sfml-graphics also depends on sfml-window. That's it for dependencies. Important: if you link against dynamic libraries, you also need to define the SFML_DYNAMIC macro in your project's settings. If you don't, you will get linker errors when compiling your application. To compile SFML libraries and samples, you must first download and install the full SDK (or retrieve the files from the SVN repository). Go to SFML-x.y\build\codeblocks, and open the file SFML.workspace. 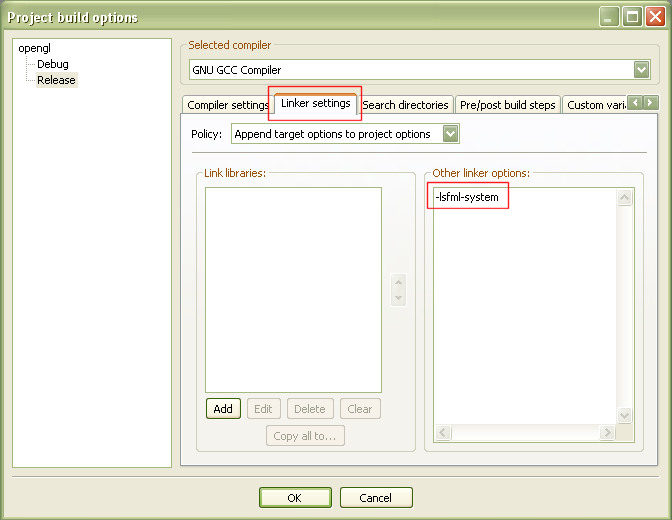 Choose the configuration you want to build (Debug or Release, Static or DLL), and clic "build workspace". This should create the corresponding SFML library files in the lib directory, as well as the sample executables. Compiling SFML static libraries with MinGW requires an extra-step if you want to include the external libraries as well. If you don't do it, you will have to explicitly link with the external libraries used by SFML in each of your programs. Unfortunately Code::Blocks can't perform this step automatically, but a batch script named build.bat exists in SFML-x.y\build\codeblocks\batch-build. This script automatically compiles the SFML libraries for all configurations (debug/release static/dynamic) and performs the extra step required for static libraries. All you have to do before running it is to make your Code::Blocks executable (codeblocks.exe) available, i.e. 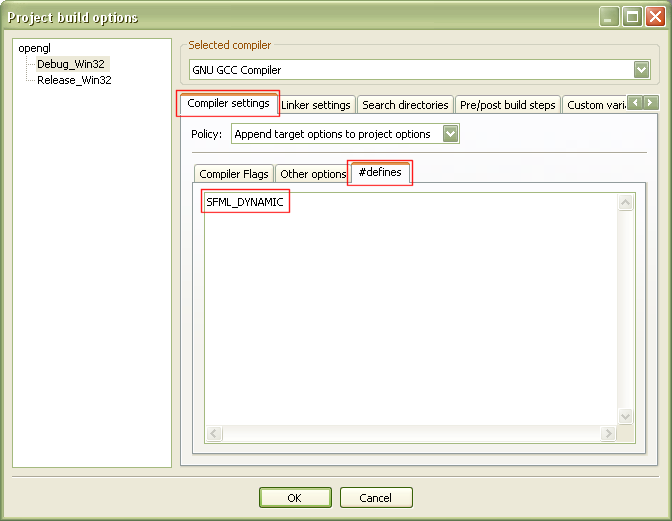 add its path to the PATH environment variable.